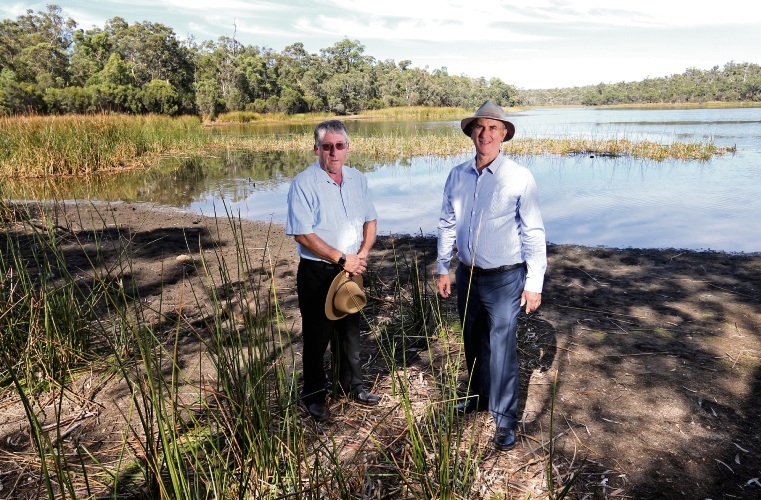 WHILE Lake Leschenaultia is already considered one of Shire of Mundaring’s most spectacular locations, it is set to offer the community even more reasons to visit, thanks to federal funding from the Department of Industry, Innovation and Science. The department has committed to investing $102,872 from its Building Better Regions Fund (BRRF) which supports projects involving either the construction of new or upgrading existing infrastructure. The funding investment at Lake Leschenaultia in Chidlow will help promote and support tourism growth in the eastern region of the shire. Shire President John Daw said the upgrades at the lake would include a small outdoor stage to help bring new events to the area as well as well as terraced picnic areas, accessible pathways and eco-zoned landscaping. “Lake Leschenaultia is steadily becoming a much sought after venue for a range of different events,” Cr Daw said. “The Maida Vale Masters Swimming Club has been holding its annual open water swimming events at the lake for more than three decades. In 2018, the shire worked with Perth Trail Series and hosted the groups’ first ever ladies only running event, known as Lake Lash Dash which was a huge success. Upgrades at Lake Leschenaultia will also incorporate 2,500m2 of redeveloped land with new picnic spaces, turf and native flora.